If you subscribe to our quarterly dashboards and reports, you’ll see that one of our areas of interest is the process of applying for new banking products online, particularly on mobile devices. Which banks allow customers to apply online and in-app? How smooth is the process? 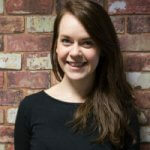 And what are the outputs – do customers get an instant decision? We’ve taken a look around the world of web design and ecommerce to see what improvements could be made to application forms, and how some small changes could greatly improve the user experience. If someone is logged into digital banking and chooses to apply for a new product, why should they have to enter their details again? You already know a fair bit about them. Ideally, whatever information you need that you already know should be pre-filled, with the option to edit fields if appropriate. Our recent Credit Card Dashboard highlighted that NatWest has added the functionality to apply for a loan or credit card within its mobile banking app. 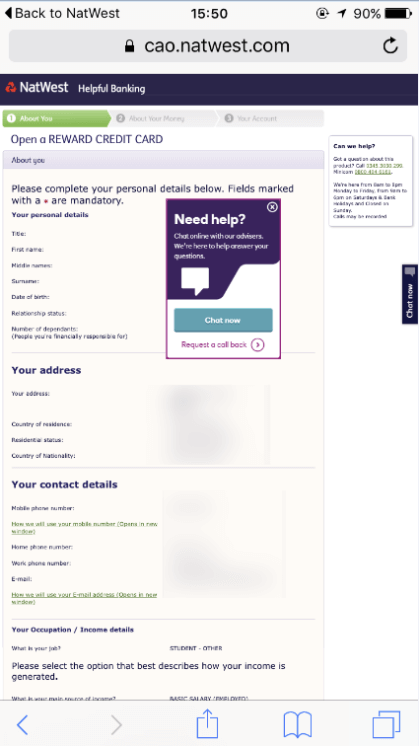 Although the form opens in the mobile browser, not in the app, the form is pre-filled with the customer details – making it far quicker to complete. Sadly, the form has not been optimised for mobiles. If someone has entered an invalid value (like an email address without the @ sign), why not tell them straight away? Real-time validation means not letting users proceed to the next question if they haven’t answered the question before correctly. As long as you make it clear what people need to do to fix the problem (see point 3) this can save a lot of time and scrolling. 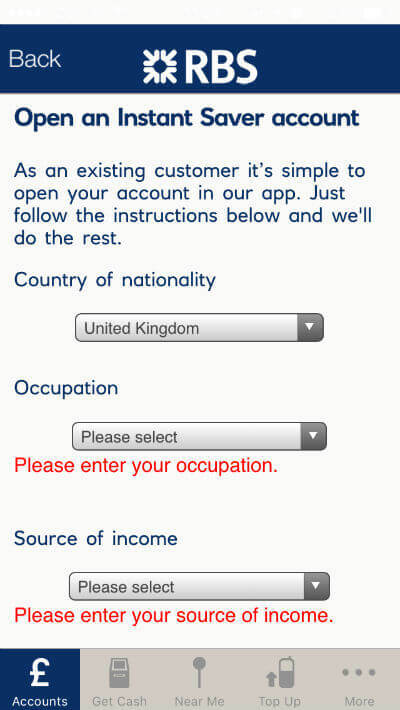 RBS (see screenshot) lets customers apply for Instant Saver accounts within the app, but as soon as you open the form it displays error messages beside each input. Give users a chance! As above: guide your customers to get it right, at the right time. When something goes wrong, how and when do your customers know? Are they given clear instructions on what to do next? Even better, does the tone of voice continue to support your brand or does it sound like a robot? Do you need a checklist, a yes/no toggle or a free-entry text form? The answer is generally: whatever is simplest for your customers. Of course, the type of input you require will also depend on the back-end systems that are collecting and ultimately using the data. Make sure you use the correct HTML5 ‘type’ attribute for the data you want to capture – this will drastically improve the experience on mobile. You can also use the ‘datalist’ element to give users suggestions as they type. An empty field is also visually more helpful when it comes to completing forms. Have I answered all the questions? It may sound obvious, but do give each field on the form a label that makes sense. Labels can help provide instructions: think ‘Full name’ and ‘Last name’ versus ‘Name’, or ‘6-Digit Password’ versus ‘Password’. Most users expect to move to the next question when they hit ‘return’. Make sure that they can. These are not always necessary if you have a simple form with great labelling and relevant, helpful error messages, but occasionally a form warrants the inclusion of tooltips to guide people through the trickier parts. Change the length of fields to suit the information you expect the user to enter. For fields like postcode, make the field short. Varying the size of the field helps the user by giving them a visual clue about how to fill out the form and gives less of a “wall of boxes” effect. You can use the HTML5 ‘size’ attribute to vary the length of a field. Sometimes you do need to capture a lot of information from people (see point 10). 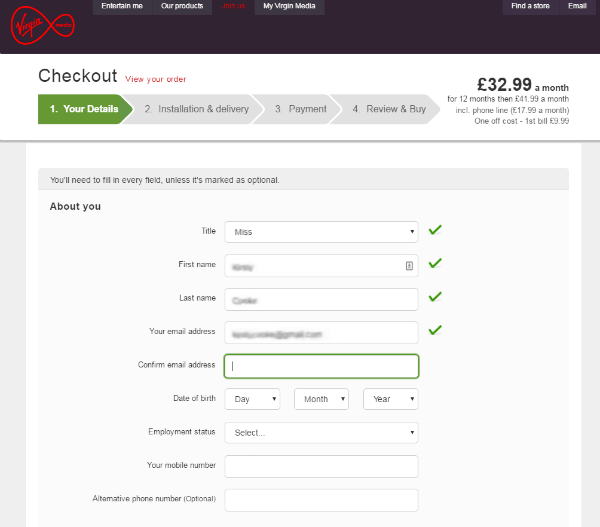 But, since long forms can be really off-putting for customers, a progress bar like this one from Santander can be useful. 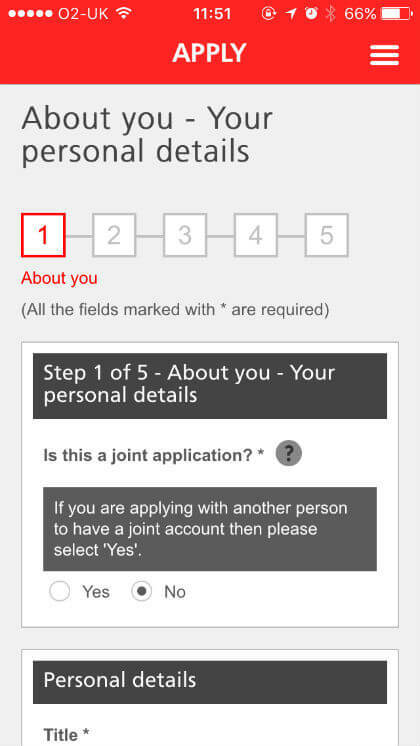 Santander not only shows app users where they are in the process, they also offer handy tooltips and avoid the dreaded placeholder text. The less information you capture, the more likely users are to complete the form. Only capture information you’re going to use. It’s as simple as that. We know that banks have regulations to meet and legislation to follow – it’s not always straightforward to create simple forms. But wherever possible, and within the confines of your legal obligations, painless forms help to create a better customer experience and increase the likelihood of conversions. Our quarterly dashboards record the changes that we see across the world of digital banking. Subscribe to these and see which banks have launched new application processes across their desktop, mobile and tablet banking, whether that is for a new credit card or a personal loan. For more information, contact us today.